When I was a sophomore, I took a glass fusing class at the Art Center in Oglesby Union on a whim. Glass fusing sounded like so much fun! During the class I met a friend, Alyssa, who worked in the marketing office there in the student union. As soon as she heard that I was interested in graphic design, she convinced me to work there. She gave me her boss’ contact info and proceeded to nag me for the next week until I contacted Larin, her boss, and set up an interview. I went in, showed Larin my portfolio, and ended up starting the very next week. Fast forward to my senior year. I have been working at the DSA Office of Marketing and Communications for almost three years. When I found out I could work there as an internship and get credit for working at the BEST job ever…I flipped out and signed up right away. The great part about this internship is that even though I have worked at the marketing office for a while now I am still learning a ton of new stuff. Because it is now an internship, my job is a little different than it was before. 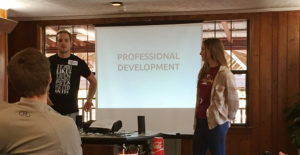 Larin has me taking on larger jobs than I have done in the past such as training new students in office practices and showing them how to use the programs. He also has me working on my professional portfolio and resumé. It was a little challenging at first taking on more responsibilities than before, but Larin and the senior staff are very helpful and willing to answer my many questions. That is one of the great parts about working at this office as an internship; it is a great learning environment. 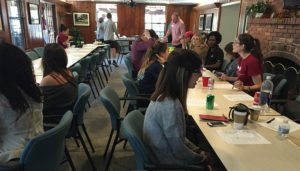 All of the students and staff are eager to help fix any problems and answer questions.We recently had an office retreat at the FSU Rez (pictures below). We played a few team-building games, had lunch together, and attended workshop sessions that help us not only in the office, but out in the “real world” too. 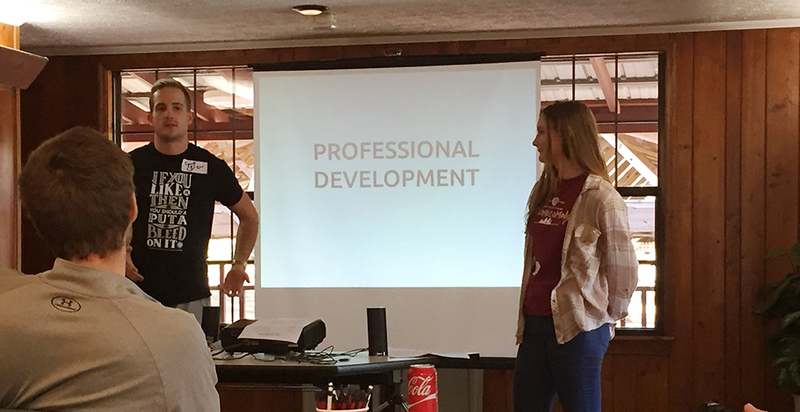 I was able to see Tyler Trobert and Kristen Brittain’s session on professional development. I went into this office knowing very little about the Adobe programs and design, but I will be leaving it not only with confidence that I know what I’m doing, but also 3 years of experience in my field. All in all I would recommend working at the DSA Office of Marketing and Communications to anyone interested in a graphic design related internship. It has been a great environment and learning experience, plus, it’s pretty cool seeing your own designs up around campus!